Through the generosity of Margaret O’Brien Hall, a scholarship fund was established in 1991. In June of that year the first two scholarships were awarded. The scholarships are presented at the chapter’s annual Flag Day luncheon in June. Margaret O’Brien Hall was born in Springfield, Kentucky, the daughter of John Milton and Margaret O’Brien Hall. She was one of ten children. The family was nurtured on faith, hard work, and rhymes-their parent’s loving legacy. Margaret published a book of poetry, For the Fun of It, and appeared on Bob Braun’s show, promoting the book and her love of life. During the Depression of the 1930s, Margaret worked as a door-to-door encyclopedia saleswoman, social worker, radio commercial writer, car saleswoman, and finally, a school teacher. She taught in both rural schools and city classrooms teaching everything from English to mathematics to manners. She taught junior high English at Hughes High School from 1957 to 1968. 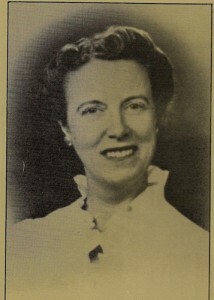 Margaret joined the Cincinnati Chapter, Daughters of the American Revolution, October 11, 1945. Through her forty-eight years as an active member of the Cincinnati Chapter DAR, she contributed to many worthwhile projects, especially the Indian Schools. Donations from the generous daughters of the Cincinnati Chapter allow us to continue offering scholarships to DAR Junior Members, high school graduates or college students who are children of or grandchildren of Cincinnati Chapter DAR members. For more information or to find out how to apply, contact our Regent.